Seven reasons why I did not like “The Hangover”. Twice. So when it first came out in the cinema in 2009, a really good friend who has a similar sense of humour as I have, gave me a call and said I absolutely had to see this movie. It was hilarious. It had style, there was enough of a story to keep me interested even though it was a very “guy” movie. Supposedly, I’d like it because I was mostly a “guy” myself and if that didn’t draw me in, there was a hot guy in it that would keep me interested. Not that he would know what a hot guy looked like, said friend was quick to add. But one of the main characters looked like my type so I should go watch it. As it turned out, I didn’t see the hangover in the cinema because I was going through my arty/independent/obscure movie phase and would not have been caught dead anywhere near a popular movie complex. There was enough talk about it in the office to make me wonder should I have seen it anyway. Everyone loved it, everyone was talking about it and the trailer was on the television all the time. I began to suffer intense FOMO (or, to those not familiar with the acronym plagued word we live in Fear Of Missing Out.) and decided a few months later, to borrow the DVD from another friend. I didn’t laugh once. Not even a giggle. I began to dread the inevitable “so, did you like the hangover?” questions that were going on all. The. Time. It was like the year The Matrix was released. You were nobody unless you’d seen the movie and everyone was gushing about it. any dissent from the ranks was poo-pooed and one’s cinematic tastes were called into question. Seeing as how I was one of the masses at the time, I got a bitter taste of what it must have felt like to be against the popular current. Every time the question came up, I’d hemm and haww and mumble and change the subject. Krys saw the movie months after I did with two of his really good friends and I was so grateful that he said, as the two others went limp with laughter and nearly wet themselves, he sat through the entire one hundred minutes bored out of his mind. I don’t know what I would have done if he’d loved it. But it bothered me. Why didn’t I like this movie? It did have all the things that I loved about a good comedy and yet I just did not like it. So, Friday night, I was flicking through channels and there was Bradley Cooper sitting behind a school desk and I thought. Great, It’s been five years (wait, five years? f******k!! ), maybe it’s time to try again. Maybe that was a fluke in a year where I had had a really emotional time and now I’m more carefree, I’ll probably find this hilarious. I think I giggled once, when the Tiger wakes up in the back seat of the car and the three men freak out in the front seat. Once. And yes, I watched the whole fecking movie this time around too. That’s one hundred minutes of my life I am never getting back, but It’s bothered me so much that I thought all weekend about why I just do not find The Hangover funny. The supposed friendship. It seems highly unlikely that these four people are friends. Call me shallow but the dentist guy seems to have serious issues with his girlfriend that I can’t even begin to get into. The character played by Zach Galifianakis: hello! These guys would not be caught dead with him in that outfit on the night they go out on the town. We’re not given nearly enough of an insight into their personalities for me to believe they would. Zach Galifianakis.I love this actor. I loved him especially in the series Tru calling where he plays a very droll mortuary attendant who is one of the support structures for the main character. In this movie, I just felt he was the bumbling idiot. I spent the whole time thinking Zach, you’re better than this dude! Heather Graham. This is a woman I have a massive crush on. She’s gorgeous and funny and has a body I would happily kill for, and yet here she was playing the same bloody character I’ve seen her play a dozen times. Jade the stripper is the exact same character she played in The Guru, Austin Powers: the spy who shagged me, Boogie night, Bowfinger. Yes, she’s made tons of other movies I haven’t seen yet, but all the ones I have seen, she plays the same exact woman. I wasn’t even surprised when she came on screen because who else would it have been. Bradley Cooper. He was the only reason I gave in to trying to watch it again. The first time around, I didn’t know who he was. But in the last few years, I’ve watched American Hustle, The silver linings playbook, Limitless, and even remember him from the wedding crashers. He’s a good actor. So I thought maybe I hadn’t been paying enough attention to his acting in this movie. Nope. Still didn’t do anything for me. Mike Tyson. I do not like the man. At all. ‘Nuff said. The baby. I won’t even go into how wrong all the baby stuff is. That’s the mum in me talking. Forward-facing crotch dangling carrier, banging the head on the door, riding in the car in a car seat belt…and Bradley Cooper’s character is supposed to be a dad??? Horror! Bachelor parties in Vegas. This has been done to death. And my heart was already won Very Bad Things back in 1998. Cameron Diaz, Jon Favreau, Christian Slater, Jeremy Piven. I laughed till I nearly wet myself. I don’t think any guys-do-bachelor-party-in-Vegas movie will ever top that for me. So , no. I shall not be watching Hangover two or three anytime soon. Life is too short and I’m not wasting it on bad sequel. You haven’t missed anything. I really wish I hadn’t watched it the second time around. But the reviews wee so good from nearly everyone who saw it! Nice review. I watched a terrible film called Bad Neighbours last night, so I’m in a good zone for mini-rants about bad films. 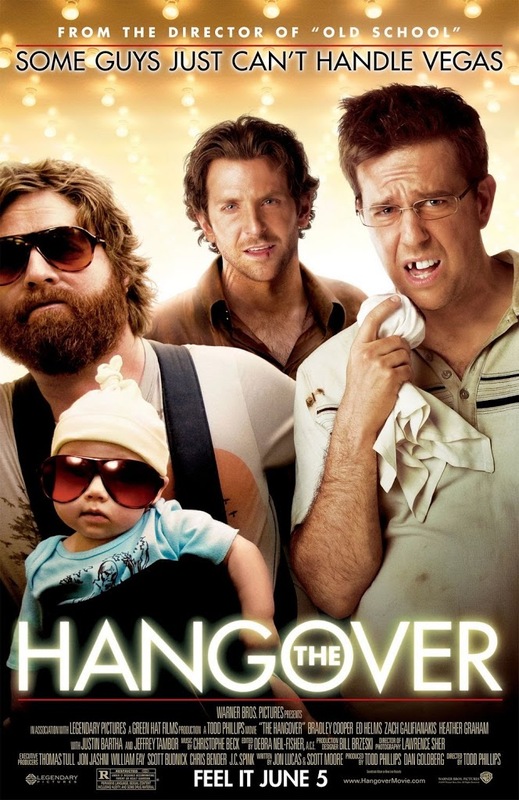 I thought the Hangover was OK but nowhere near as funny as people said it would be. Sadly, I made the terrible mistake of watching The Hangover Part 2. Well, half of it, that’s all I could mange. I was actually planning on watching bad neighbours….thanks for the warning! And I actually like Zac Efron, so that’s very sad.